Festive binging in children need to be controlled. Use natural sweeteners like jaggery. Avoid sweets with artificial colour. It’s that time of the year again when you just love to indulge in sweets. With the festive season’s like Ganpati, Navratri and Diwali being just around the corner, it’s very difficult to resist your temptation for sweets like modaks, ladoos and jalebis, no matter which age group you belong to. Festive binging of sweets especially in children need to be controlled because sweet binging brings with it a lot of health risks. It’s advisable to consult your paediatrician in order to help your child follow a healthy and balanced lifestyle. Children are born with more taste buds than adults and have an innate preference for sweet taste. High level of sugar intake is the root-cause of childhood obesity, which in turn contributes to hypertension, hyperlipidemia and Diabetes. When taken in a small amount, sugar intake will not prove to be harmful. But an excessive intake of sugar tends to replace the intake of nutritious food, thus causing detrimental effects in the child. 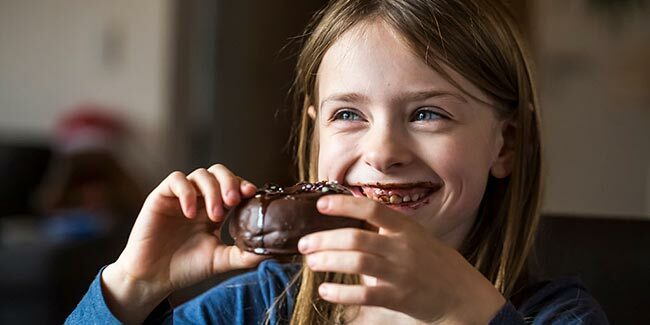 Studies have also proved that children who consume foods with a higher sugar content during their early childhood, end up craving for it even later on. Hence it is important that parents monitor their child’s sugar intake early on during their childhood to avoid future health problems. They should accordingly modulate the child’s taste buds, so they end up eating less sweets. A marginal sugar intake is not harmful for your child. Just ensure that you do not overdo. formation, dental decay and cavities are on the rise. Contaminated/improperly stored sweets can lead to food poisoning and stomach infections. Colouring agents in sweets can give rise to food allergies. Below mentioned are some tips to control your child’s sweet tooth during the festive season. 1. During festivals the wide assortments of sweets before you really spoil you for choice. Children really can’t resist their temptation and might end up binging each and every sweet that has been offered to them. This will definitely result in an overdose of sugar. You must teach your child to be selective and choosy. Children should be taught to pick up either one or two sweets rather than munching over everything that’s on the plate. Small bite size servings are helpful to reduce overindulgence. 2. During festivals if children are on empty stomach they will definitely feel like binging. Always ensure that your child has eaten a nutritious diet before stepping out anywhere to celebrate. This will not urge them to indulge in festive sweets. 3. Ensure that homemade sweets are preferred over store bought ones; avoid sweets with ‘varkha’ or foil on them. Avoid intake of sweets using lot of coloring agents/additives/taste enhancers. 4. Use natural sweeteners like jaggery (rich in iron too), honey,dates, anjeer,etc instead of as a replacement for sugar. Also safety of artificial sweeteners in children is not well documented hence recommended to avoid using for children. 5. Lastly parents themselves need to be good role models. If they themselves keep away from having too many sweets, the children will automatically follow suit. With the festivity picking up its pace, refrain your children from sweet indulgence. 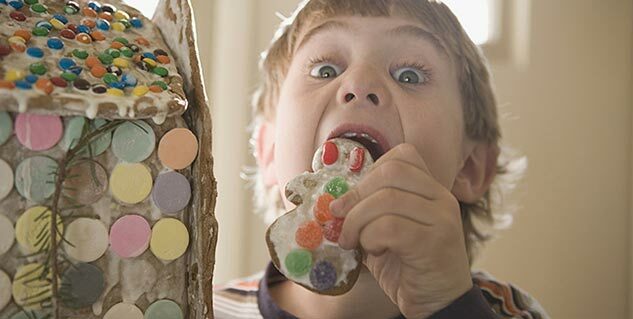 In the midst of the festive spirit, parents often fail to make a note of the child’s sugar intake, without realizing the possible health risks that await them. So please don't ignore what your child is binging this festive season. Is this Festive Season Turning you Crazy?